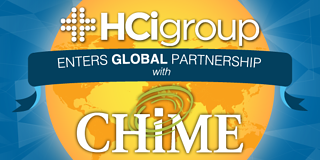 SAN ANTONIO, TX – November 2, 2017 -- The HCI Group (HCI), global leader healthcare IT consulting and services, announces its partnership with the College of Healthcare Information Management Executives (CHIME) to become a CHIME Global Partner. As a CHIME Global Partner, HCI will be able to offer its expertise in healthcare IT consulting and services. Recently recognized by KLAS as the top healthcare IT consulting firm in the world for its unique combination of high competency and value, HCI’s international growth creates opportunity for deepening relationships with CHIME members across the globe. Branzell introduced the Global Partners at the beginning of the CHIME17 Fall Forum, which draws CIOs from across the country and internationally to attend educational sessions, network and meet with colleagues to collaborate, exchange best practices, address professional development needs and strengthen partnerships with industry associations, government agencies and service firms who share a professional interest in improving the quality, safety and cost-effectiveness of healthcare. The HCI Group is a global leader in healthcare IT consulting with headquarters in Jacksonville, Florida and international headquarters in the United Kingdom. It offers a broad scope of healthcare IT solutions across North America, Europe, Middle East and Asia Pacific.